How to disable email notifications in Freshdesk or Freshservice? 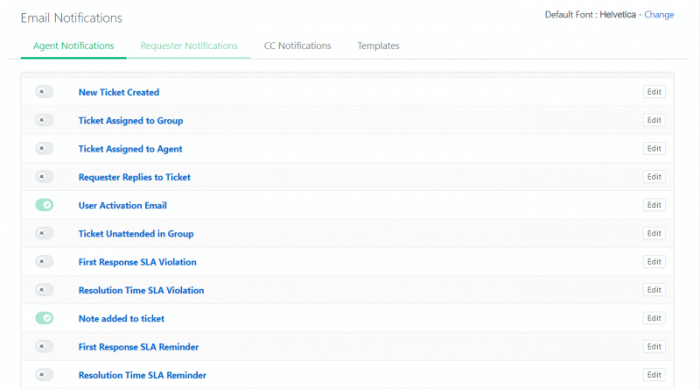 When configuring your email workflow in Freshdesk or Freshservice you can enable automatic notifications so that your customers would get notified that their ticket was created, or agents would get notifications about new comments, etc. When migrating to Freshdesk or Freshservice you should disable all email notifications, so neither your customers not agents would get emails while the tickets are being imported to Freshdesk or Freshservice. 1. Log into your Freshdesk and go to Admin panel. Note: as you go through the notifications, you will notice those that are required and cannot be disabled. 1. Log into your Freshservice and go to Admin panel.